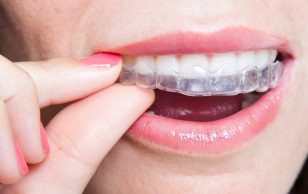 Proven effective through clinical research and practices nationwide, Invisalign and ClearCorrect use a series of custom-made, nearly undetectable aligners to straighten teeth. Because there are no metal wires and brackets, both options are highly comfortable. Each aligner moves your teeth just a little bit at a time to gently and gradually straighten them. The aligners are also removable, allowing you to eat what you want. Brushing and flossing is easy, too. Ask Dr. Dingus if Invisalign or ClearCorrect are the right choice for you.